"Vauxhall" redirects here. For other uses, see Vauxhall (disambiguation). 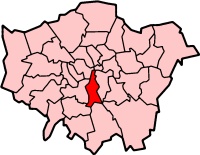 The London Borough of Lambeth is a London Borough. It is in south west London, England. This page was last changed on 18 October 2017, at 18:59.